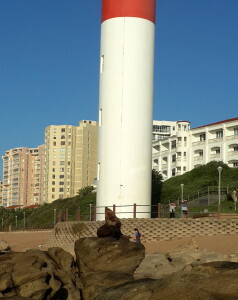 uMhlanga Seal Steals The Show! The male Sub-Antarctic Seal that took a rest on the rocks in front of the uMhlanga lighthouse on Sunday was the biggest talking point in uMhlanga this year! While underweight, the seal appeared healthy and the general consensus was that he was resting after a tiring swim from the southern Cape or even as far as Marion and Prince Edward Islands. Whatever his reason for coming ashore he sure peaked peoples interest, with the UIP facebook post on his arrival and progress reaching close on 65 000 people and being shared across the globe!